To study the emission spectra of Hydrogen, Neon and mercury vapours. Spectrometer, diffraction grating, mercury bulb, Hydrogen Bulb, neon bulb, etc. Continuous spectra-continuous band of colors is obtained. Absorption spectra-dark lines on a bright background. Emission spectra-bright lines on dark background. In this experiment a diffraction grating optical spectrometer is used to study the spectra. The diffraction grating provides the simplest and most accurate method for measuring wavelengths of light. It consists of a very large number of equidistant narrow parallel rectangular slit of equal width separated by equal opaque portion. The ruled widths are opaque to light and space between any two successive lines is transparent and act as parallel slits.Number of rulings per cm of grating used in visible region varies from 5,000 to 12,000 lines per mm. Where, m is called the order of the spectrum, λ the wavelength, N the number of lines per cm and θ the diffraction angle measured with respect to the direction of the light incident on the grating. Spectrometer is an instrument which is used to measure the intensity and other properties of light. Direction of all rays should be same and for this light which is to be analyzed must pass through the grating as parallel beam. 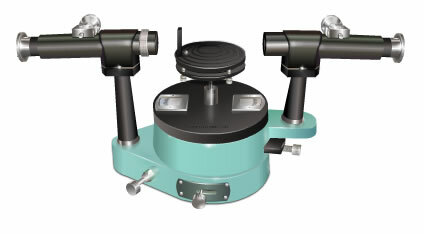 Collimator: The collimator is used to produce parallel rays. It consists of an adjustable slit and convex lens. Prism table: The prism table is circular in shape and is provided with three leveling screws. A central horizontal shelf for mounting either a prism or a grating. Vernier table: The Vernier table is also circular in shape and can be rotated about a vertical axis. Two verniers are attached to the Vernier table and they move along the circular scale, when the Vernier table is rotated. The Vernier table and hence verniers can be fixed in any position by means of radial screw. Telescope: An objective lens that focuses on the entering parallel rays in a plane so that the real image can be observed with the aid of the eyepiece. Cross hairs located in the focal plane of the objective lens. The telescope is attached to a circular scale and can be rotated about a vertical axis through the centre of the scale. Adjustment of telescope- The telescope is adjusted by looking to a distant object, until the object cross wires are in sharp focus. Adjustment of the collimator- The slit is opened slightly and is illuminated using the sodium lamp. The telescope is brought in line with a collimator. The image of the slit is observed through the telescope and is made to coincide with the vertical cross wire. The slit is made very narrow. Adjustment of prism table- The prism table is leveled using the spirit level or by optical method. In the optical method, the leveling screws of the prism table are adjusted until the image of slit is bisected by horizontal cross wire. In this experiment we are simulating the normal incidence position of grating and further calculations. For details please check the diffraction grating experiment in optics lab.